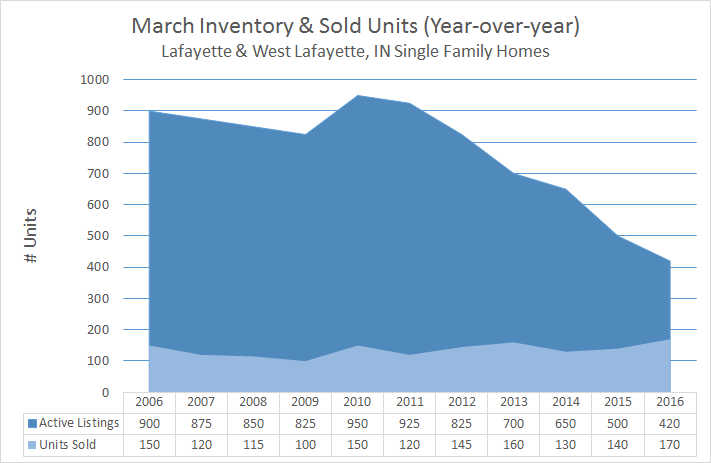 Low inventory and consistent demand have created a strong position for sellers of single family homes in the Lafayette and West Lafayette Indiana real estate markets. Inventory of single family homes hit a high in 2010 (950 units) rebounding from a 10% slump that began with the 2007 downturn in the US housing market. The number of available units has steadily declined every year for the past 6 years as new listings fail to satisfy the steady demand for single family homes. In March 2016, inventory of available units fell to 420 units; less than half that of March 2010 levels. The following chart shows the number of available homes in March year over year compared to the number of units sold in that same month from 2006 – 2016. This only includes single family homes in Lafayette and West Lafayette, IN. Source: Indiana Regional Multiple Listing Service LLC. Retrieved: 4/1/2016. This weakening supply has provided steady support forprices. The median sales pricehas risen from $119K in March 2010 to $135K in March 2016; a 12% increase and an average of 2% per year. The median number of days on market for homes sold in March has averaged 73 days since 2006. Last month (March 2016) the median days on market for sold homes plummeted to only 22 days; less than 1/3 the norm. Home buyers that plan to purchase now or in the coming months will need to be prepared to move quickly and may have to contend with competing offers from other buyers. Before you start shopping, you’ll need to have a pre-qualification letter from your lender unless you are a cash buyer. You and your agent will need to be poised and ready to move when the right property comes on the market to improve your chances of securing the home you want. If you have been waiting for an opportune time to list your Lafayette or West Lafayette area home for sale—now is an excellent time to put your home on the market. Properly priced homes that are clean and staged well are selling quickly and demanding strong prices. Your first step in preparing to sell is to have a market professional assess the value of your home. Contact us for a free personalized home value report by clicking the link below. About the Author: Don Stocks is a real estate broker with Coldwell Banker Shook located in Lafayette, IN. He specializes in representing buyers and sellers of residential real estate. His professional experience includes Fortune 50 Enterprises, entrepreneurial dot com and high-tech ventures and early stage strategic management consulting. He holds an MBA and a BS in Management from Purdue’s Krannert School of Management. Contact Don Stocks.